Sachin Tendulkar, batting with a bag of ice cube on his back, took India almost to the finish line against Pakistan in Chennai. The show ended in a tragedy for Sachin and India, and it took Sachin almost 10 years to exorcise the Chennai ghost. 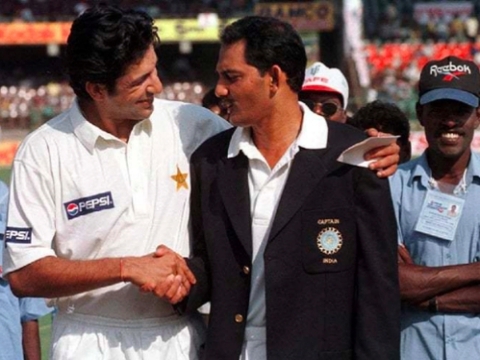 This star-studded match was one of the greatest Test matches of all time..
What was the significance of this match? First India-Pakistan match in 9 years: The battle between the arch-rivals took place after 9 years. The match was a classic. It turned out to be a battle between the master batsman Sachin Tendulkar and the wily off-spinner Saqlain Mustaq. 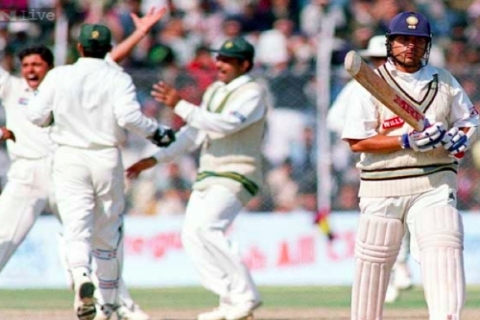 Too many legends locked horns: It was first Indo-Pak test encounter for some of the big names from both side – Rahul Dravid, VVS Laxman, Sourav Ganguly, Anil Kumble, Inzamam-Ul Haq, Saaed Anwar, Shahid Afridi, Saqlain Mushtaq. Nationalistic Fervour: The match took place few months after the two nation’s show of their nuclear prowess. Passions from both sides ran high. Sporting Spirit: After the match, the Pakistani team went for a victory lap and the sporting Chennai crowd applauded the winners. Why the memory of this match remains vivid in the minds of Indian fans? It was a classic that ended in a heart-break for India. India’s best batsman did almost all the things right. Battling a tremendous back-ache, he single-handedly guided the team to the doors of victory. A lapse in concentration while getting close to finish line, caused his downfall. When Tendulkar got out, India just needed 17 runs to win and had 3 wickets in hand. But the tail was too meek to see the chase through. India would lose the match by 12 runs. An entire nation sympathised with Tendulkar. A nation in search of a warrior against its arch-rivals, found one; the warrior fought for the glory with grace but just was not able to cross the finish line. It is noteworthy that Sachin had to bat with a bag of ice cubes on his back due to his back-pain. When did Tendulkar’s big knock arrive? Pakistan won the toss and elected to bat and made 238 runs. In their first innings, India scored 254 runs, but Tendulkar was out for a duck. In their second innings, Pakistan scored 286, leaving India with a target of 271 to chase. When Sachin came out to bat score was 6-2. Sachin made a brisk statement by hitting three boundaries. All Indian batsmen were finding it difficult to bat but Sachin batted with tremendous grit and skill. India were reduced to 86-5. Nayan Mongia partnered with Sachin and they both batted valiantly for a 136 run partnership. But then the master’s back started troubling him, which is when he shifted gears. From where did India lose the match? When Sachin’s back started troubling him, to ease the pressure Sachin hit flurry of boundaries against the high quality bowling to reach to his century. Meanwhile Mongia completed his 50 but fell soon after, playing a rash short. That’s when the moment came. In a haste, Sachin tried to hit Saqlain out of the park. He miscued the doosra, as the ball scooped towards mid-off and long-off. With only 17 runs to win, India believed that match was in the pocket. But Kumble, Joshi, and Srinath succumbed to pressure, and could only add four runs. Saqlain Mushtaq: Took 10 wickets in the match. Picked up the key wickets of Sachin Tendulkar and Mohammad Azharuddin in both the innings. Shahid Afridi: The mercurial batsman played a key knock of 141 runs in the second innings to help his team post a score of 284. He batted in the usual hurry, scoring 21 fours and 3 sixes. How did Sachin exorcise the ghost of Chennai? It took him almost 10 years to do so in Chennai. This time he played a match-winning innings against England. The victory had a national significance because it came after the Mumbai Terror attack. In his post session interview, Sachin dedicated his innings to the victims and made a statement of solidarity. Chasing 387 to win (fourth highest in the history of test cricket), Sachin essayed a 163 run stand with Yuvraj Singh. He scored his 41st test century in the process.